Home Art Director Designers, Artists, Creators – Are You Spreading Your Wealth? For the past 15 plus years I have been really really lucky in one aspect of my artistic life. 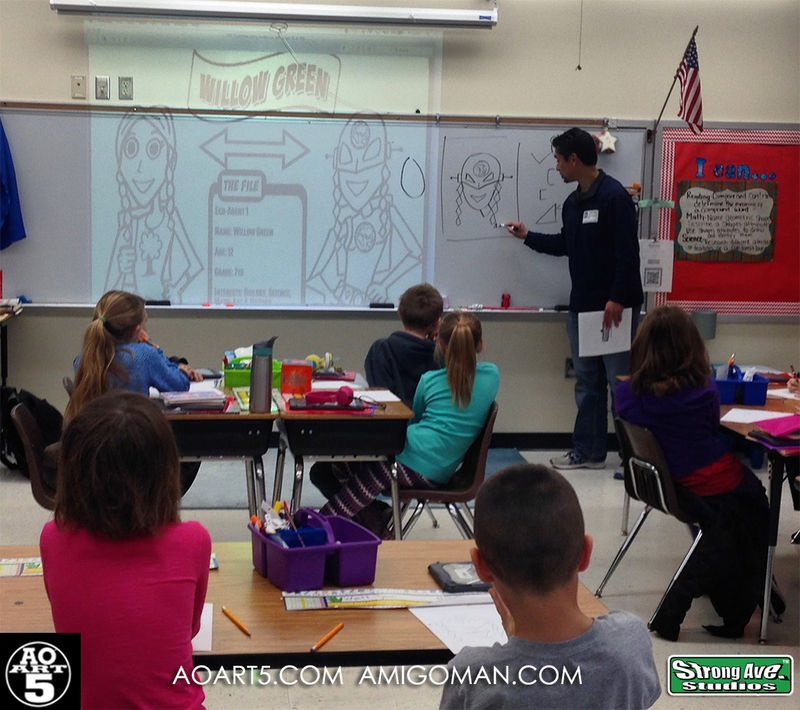 I have had the great fortunate to be able to talk, teach and discuss art – specifically comic book art to elementary kids! To me, comic book art is a combination of idea, story, character development, working with other artists, art direction, storyboard layout, typography and desktop publishing – just to name a few – and to me, there is an art in each of these. And so every year I have had the honor to visit a number of elementary schools across the KC metro about something special to me – art, story and character art. More specifically, I enjoy discussing my art (and when I say “my art”, I mean the art I create with fellow artist like Lorenzo Lizana and Jon Woodard), my stories (I create my own stories) and my character art ( I create my own characters). And yes, most of my talks have been with to elementary kids – and all have been awesome! But why, you might ask. Its simple – there is a need to talk to these students. With art being taken out of the curriculum and school schedules being squeezed, the higher the grade level a student climbs, the less amount of time spent being creative in class. So, I believe, most importantly, these kids need it. Don’t get me wrong, when I started, I knew most, like 99% most, schools did not know who I was, let alone know my comic book character – an unknown, non-mainstream Latino comic book super hero named AMIGOMAN™. What I also knew was that kids love art, just like myself and many of my friends did early on in our lives, and I felt that I had something to share with them. And because most students, especially at the elementary school age, are eager to learn, they are honest, they love every kind of art (pencil, markers, colored pencil, paint, and water color, it doesn’t matter. ), teachers love the break in the action – but most importantly, as I mentioned before – I believe most creatives in the industry do not see a need to share something cool with school kids. Plus, most creatives find out there is little to no pay in these visits. And for me, I actually made negative pay. Now you are probably thinking, “What do you mean by negative pay?”. Well, I believe most creatives starting something new or alone, like I did, know what negative pay is already. Negative pay is where I was paid nothing for the visit and I paid for the materials I gave to the students (such as books, coloring pages, bookmarks, etc) all free. But, for me, the negative pay was something I knew was part of the deal – and I had to remind myself of the big picture with this project, and that I had limited time, knowledge and resources (and sleep) to produce the highest quality of work (like this blog post – I have limited resources, so I have no editor, so please excuse any typos and poor use of grammar. Seeking editor soon). But, I made it a point to always have something and leave something for each and every students on each and every visit. Then and still now, the best “pay” for the visits are the awesome and thoughtful questions the kids throw at you, the “OOOOOHHHH’s”, the “AAAWWWEEE’s” and the “WWWOOOWWW’s” of our sketches, page layouts, videos, and examples of scripts we produced. Age or grade doesn’t matter, they all have great and intelligent questions about process, logic behind development and how something is created – to name a few. It is amazing! The other payment for me is that thought in the back of my mind that maybe, just maybe, that my visits were giving these students a bit of inspiration and hope. That maybe my visits will give them a bit of hope that someone like them, someone from the same city they are from, can create something cool like what they see on TV, YouTube or at the comic book shop or sites. And that maybe someday a handful of those students would be inspired to pursue creative careers – but hopefully more successful and maybe for the big boys like Disney or Pixar. So today, it’s been paying off – in more ways than one. Now, I know I do not work for really cool, cutting edge, super creative ad companies like Barkley, VML or Trozzolo here in KC. And I have never worked for Disney or Pixar. And we all know I am not a world famous sports painter, an award winning graphic or web designer, and we definitely know my AMIGOMAN™ and Eco Green Team (recycle based stories) comic books are not million copy sellers, and are not a mainstream publication similar to the likes of my favs like Batman or Spidey, not by far. Nevertheless, what I do know is that what I have created and produced on the comic book side has amazed the hundreds of students and teachers I have had the honor to visit each and every time! And now – I believe due to the “sticktoitivness” I have engrained in me (along with the multiple cups of coffee per day), I now get paid for my visits, and many schools receive purchased books. And sure, I have always wanted to work for Disney and Pixar in their story and animation departments, and I have always wanted to get my AMIGOMAN™ comic book story on PBS Kids, and those ideas are still out there, but when the students ask, ‘When is the next book coming out?”, “Will you be back next year?” or “Are you going to make an animation of AMIGOMAN™?”, I tell them that I hope to real soon. And I really do. And then a few minutes later as I drive off of the school property I think to myself – I may have just visited a class room or two with the next Walt Disney, John Lassiter, Brenda Chapman or even Jennifer Yuh Nelson. And if I have, I hope when they reach the heights of their creative careers, they remember to visit schools to give demos, answer questions and most importantly – share the wealth of knowledge and inspiration.